It is a match of loose wave 3 bundles with 1 loose lace frontal. 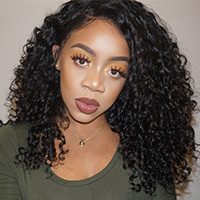 Bundles with frontal, one of the best matches for African-American women who want a full and thicker hair. There are a lot of lengths options, you can choose the most suitable bundles and closure length according to your existing hair. The hair of bundles and frontal is collected from different regions of Brazil. The loose wave hair bundles come with 3 pieces, while lace frontal comes with 1 piece. Both loose wave hair bundles and frontal use 100% human virgin hair, which has never been chemically processed, the hair is top grade virgin hair, wavy pattern is so natural that could perfectly match your natural hair texture. Lace frontal uses a piece of lace base measured to be 13*4 inch and the hair attached will match the bundles hair texture well. Purchasing our bundles with frontal not only save you a lot, but they also offer you a more natural appearance.